I’ll just say that perhaps our plan for this whole day was overly ambitious, this fourth day in our vacation. This was the same day I wrote about in the post below, where we left Ashland in the morning (after dwelling way too long at a posh hip diner in town with terrible, annoying alleged free wifi) and drove north to points just south and east of Portland, where we hiked an hour or more doing the GC16 cache, and then afterwards, where we made our pilgrimage to the spot that started it all. In May of 2000, Dave Ulmer hid a bucket here and then posted the coordinates on a website and asked people to see if they could find it. This was the beginning of geocaching, but before there was even a word for it. So many people were interested in the concept, and then wanted to hide their own and find more, that a game was born. Read more about the history of geocaching here. Eventually this original geocache was destroyed, but Team 360 and some others realized the importance of this location and had the plaque made. 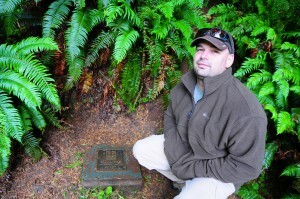 A person finds the plaque and signs a log at the nearby ammo can to claim the find. I had actually logged this find in August of 2008, in a previous life, but J had never been here. As someone who has been involved with the game from the early years (2003), I thought he really should have this find under his belt. Plus, it is part of what is called the Geocaching Triad, or Trifecta – which includes the (now archived but reborn as just a regular) APE cache, Groundspeak Headquarters, and this cache. We were headed to Groundspeak later this week, and I wanted us both to be able to say we completed the Triad. Meanwhile, while he was checking it out and signing the log, I made the trek right up the hill behind this cache site to get a grandfather cache, GC92, or: The Unoriginal Stash. I didn’t get this one last time I was here because daylight was fading and I really needed a flashlight to be able to find it, and it is up this hill that is really muddy and slippery. That day, I had already gotten the bottom of my jeans dirty that day and we were kind of in a rush to get to the Portland airport at the time to fly back to Houston. This time I had daylight and wasn’t in a terrible hurry. I didn’t fall down either, which I thought was impressive because it had been raining on and off out here (go figure, being so close to Portland) and the ground was quite wet. We weren’t in a particular hurry up to this point in the day, but perhaps we should have been. The thing is, we didn’t give ourselves enough daylight to get to GC12 and 17 together in one day. GC17 we ended up having to skip entirely. It’s a five mile round trip hike when done correctly. We had about an hour until the sun went down when we got to the area where the trails began, and we gave it all up on GC12, which should have been a lot simpler. 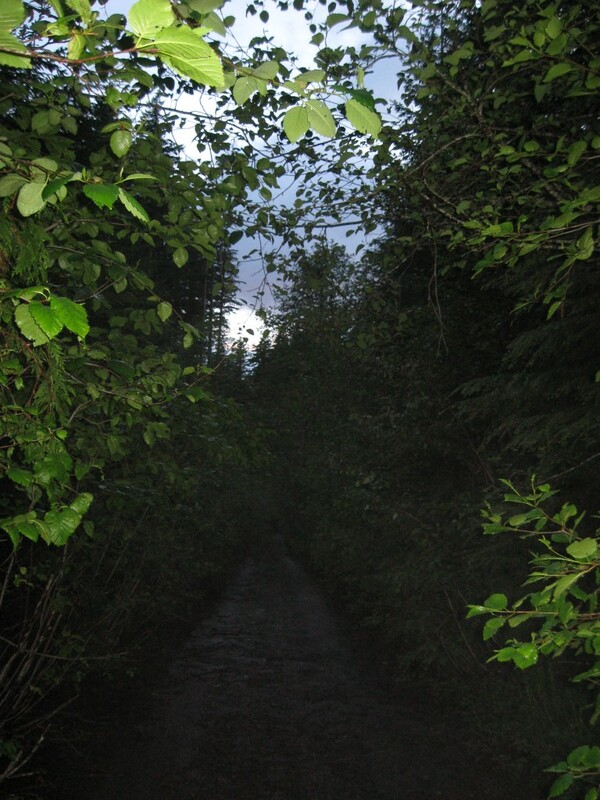 To get to GC12, you take these forest roads that get more narrow and remote. We finally ended up parking at this “y” juncture and first taking the wrong fork, then the right fork to walk to it. It was only about a half mile walk but it was like the longest half mile ever. Some people drive right up to it, but the trees lean their branches in and scrape their little “fingernails” against the car, and we didn’t want to have to pay for a paint job on the rental car. So we walked, but we weren’t really thrilled about it. I think we were sore from some other hikes or just kind of tired and not in the mood, but mostly we were a little freaked out, feeling really small and vulnerable in this forest. J was worried about human predators and I was worried about animal ones. Then, the cache took forever because it was surprisingly hard to find, considering it is a big white and blue bucket. So it was almost dark when we got back to the car from this misadventure. Plus, we needed to find a camping spot for the night, and my original idea was to find one northeast of this little area, and we never made it out that way. We had a long day of hiking and driving and the last thing we wanted to do was go without dinner and fumble around in the dark pitching a tent to stay in for one night, so we wended up paying too much for an only halfway decent hotel in Sandy, Oregon. Now we’ll have to go back to this area one day, yet again, so I can scratch that darn GC17 off my list of the oldest geocaches left unfound.